Ohio State's newest residential district redefines the student housing experience with density and a new approach. At the start of the 2017 school year, The Ohio State University initiated a program to redefine the student experience with a focus on enhancing the education of students beyond the classroom. One of the pillars of this experience is a two-year on-campus residency requirement designed to lead to higher graduation and retention rates, improved student engagement and satisfaction, and post-graduation success. 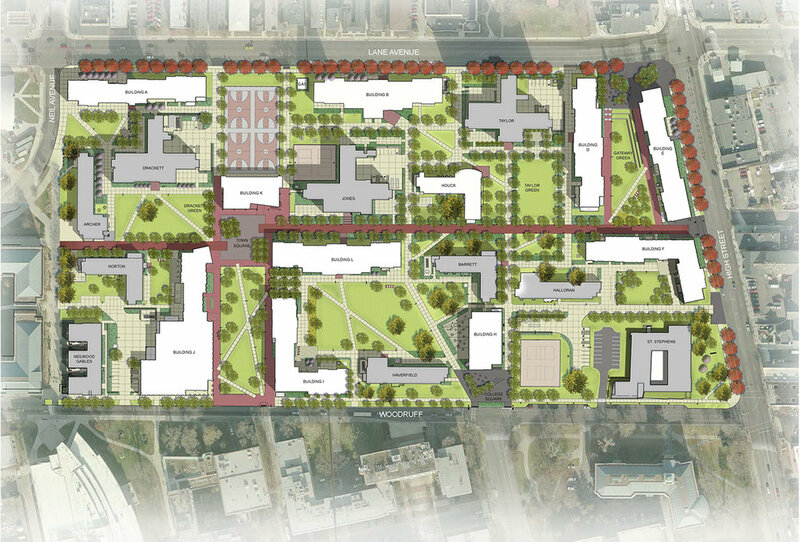 Prior to this change, only first-year students were required to live in university housing, so to accommodate the program, the North Residential District was reimagined as a dense student population center. MKSK was part of a multidisciplinary design and construction team (Design-Build) led by HKS and Messer Construction, for the renovation and transformation of the North Residential District with the addition of new student residential facilities, dining, recreation and other support facilities. The Development Criteria Plan was produced in conjunction with Olin and Acock Associates Architects. MKSK was Project Landscape Architect during implementation, responsible for design development through construction administration. The new, densely developed District is carefully planned in a manner that reflects the best practices in urban design, architectural aesthetics and campus-based student residential life. The development was guided by the North Residential District Plan (2012) and One University Framework Plan, and will support the Universityís Second Year Transformational Experience Program (STEP) whose core focus is providing an extraordinary and individualized experience for students.